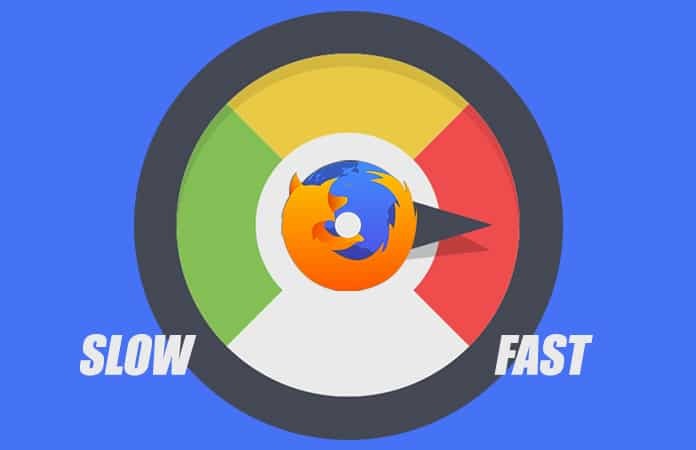 Mozilla Firefox has a new feature named Electrolysis, which increase the content process speed by default. However, we have seen many of the Firefox users complaining that their Electrolysis feature is disabled by default. And they still encounter this problem when they update their Mozilla Firefox to the latest version. Nevertheless, you can enable this feature to make Firefox faster. Before we begin manually enabling the multi-process Electrolysis, abbrev. E10S. You have to check first that you’re not using any incompatible add-ons for the browser. As doing so, might be one of the causes of E10S being disabled. You can start the process by checking yourself if the multi-process is disabled or enabled. To check, in the URL type the following, about:support. 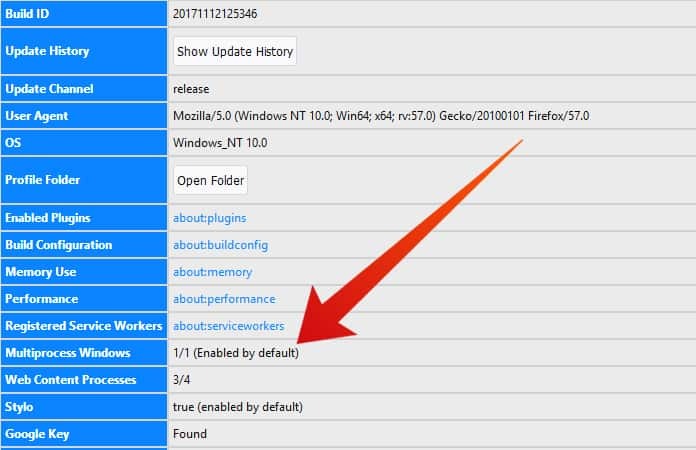 A new window will open up with all the ‘Troubleshoot Information’ and under the ‘Registered Service Workers’ you will find the ‘Multiprocess Windows’ tab, beside the tab if it’s mentioned ‘1/1 (Enabled by default)’. Then your multi-process is enabled and you don’t need to worry about it. But if it is mentioned Disabled then read on. 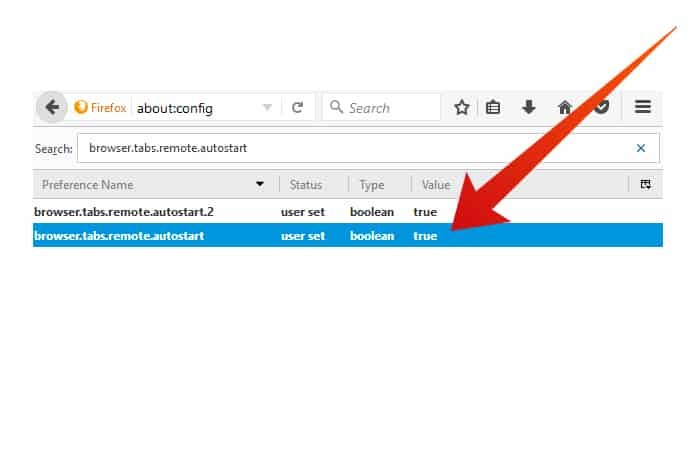 Step 1: Type about:config in the Mozilla Firefox URL. Step 2: Then, click I accept the risk! if the warning message appears. Step 3: After that, you need to find the term tabs.remote.autostart, you can search it by entering the term in the search bar. Be cautious when you’re entering the Preference name. Step 4: Finally, you have to double-click on the option to set it as True. It will then enable E10S, and if you want to disable it then double-click again until the value is False. After following the above instructions you can check again if the multi-process is enabled or not by going to about:support page from your URL. Now, it is a possibility that the process is still disabled, one of the reason because of any incompatible add-ons. It will let you know why E10S is not enabled. So the next option you can try is to force Mozilla Firefox to enable the multi-process. It has now stopped any incompatible add-ons to disable the E10S. Now search for the term, e10sMultiBlockedByAddons. So, if you will go to check the multi-process status by again going to about:support, you will see the text ‘Enabled by User’. However their risk involved when force-enabling the E10S, you can check it in the Mozilla Firefox Wiki. You can also increase the content processes to make Firefox faster. By default, only 4 content processes are enabled but Mozilla Firefox is able to support 7 of the processes. 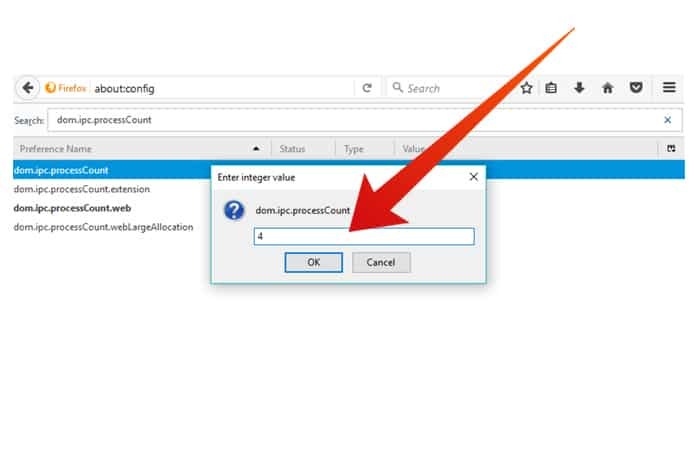 So to change the number of the content process go to about:config and then search dom.ipc.processCount. Now, double-click on the preference and then enter the value above 4 and up to 7. Let us know in the comments below by following the above-mentioned instructions, were you able to make Firefox faster? Or do you know any other methods to make Firefox faster?